The influential publication The Economist released its traditional end of year edition where it predicts events of the coming year. The 2017 edition is presented in a very occult fashion: A tarot deck modified with cryptic symbols. If you thought that 2016 was not a great year, well The Economist does not seem to optimistic about the year to come. 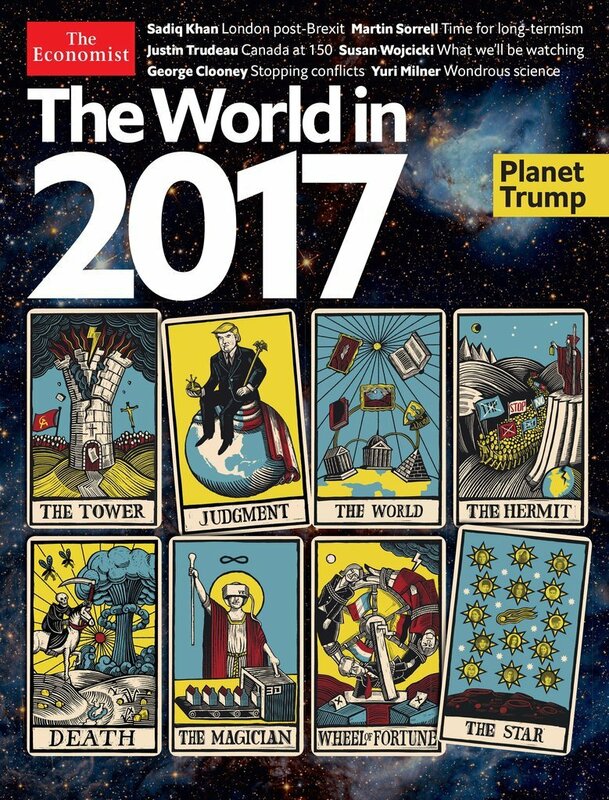 Indeed, in its “The Year in 2017” cover, the publication predicts death and turmoil in a dark occult context, using tarot cards and cryptic symbolism. While some images on that 2015 cover referred to obvious events, others were extremely cryptic – even ‘coded’ – as they were never satisfactorily explained. This year’s edition is even more enigmatic. It uses the tarot to predict the year to come. Here it is. The first thing one can say about this cover is that it is occult. The tarot is indeed said to contain within its symbolism the entirety of occult mysteries transmitted by secret societies. Also, considering that the cards of the Major Arcana is also referred to as “trumps”, it was a great way to emphasize that next year will be very influenced by Trump’s election.